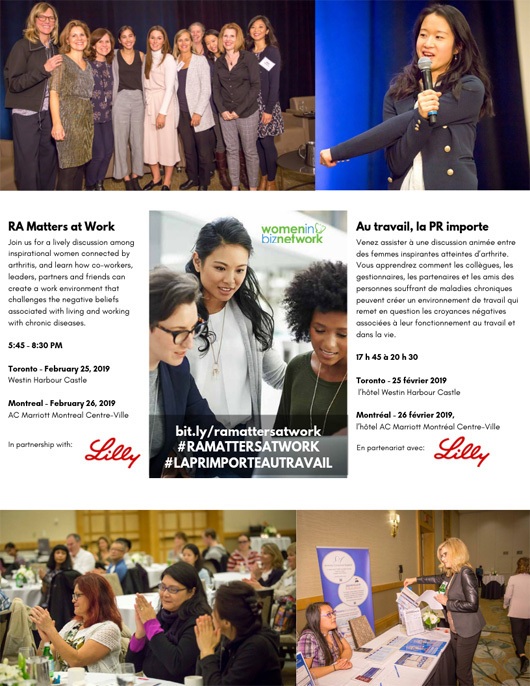 To bring attention to the triumphs and challenges of people working with chronic diseases like RA, Women in Biz Network and Eli Lily Canada are partnering on a nationwide series of empowering events called #RAMATTERSATWORK. Join them for an evening of lively discussion between inspirational women living with arthritis and their health experts. Speakers will share stories of difficulty and triumph while thriving in the workplace, and challenge the negative beliefs and self-doubt associated with living and working with a chronic disease.